My father had a very successful jazz band in college, played the saxophone and had a wonderful baritone voice. My mother played the piano by ear and could magically harmonize almost any song, but, the musical gene sorta skipped me. I did sing soprano in a pretty popular singing group way back when, but when I tried to learn to read music, the nuns told me it was hopeless. I dreaded my weekly piano lesson when I was 8. But, I figured out if I just watched Sister Frances play the songs on the piano and listen to the tune she was assigning me during my weekly lesson, then I could go back and not have to practice at all and just play the tune by ear at my next lesson. It worked for a while, but, Sister Frances wised up. She caught on when she kept pointing to notes and I could not recall them. Busted! But, whether you are a musician, singer or a listener, you probably feel how powerful music can be. It has the ability to set the mood instantly, does it not? It can bring up emotions and intensity the moment. Yes, it is a real game changer! But, let me show you the many other powerful ways it can affect your health, too. 1. PLAY TUNES AN HOUR A DAY TO KEEP THE DOCTOR AWAY. Listening to music that pleases you may increase your immunity, which in turn helps fight disease. It lowers stress hormones that harm our body. Don’t miss this: A diet rich in vegetables can strengthen your immunity, too. Tap here for lots of delicious recipes for them. 2. POUNDING HEADACHE? MUSIC MAY HELP. REALLY! Yes, it sounds counterproductive, but, I have the playlist right here for you to lessen the pain. Although there may be a tendency to search for quiet when your head is pounding, studies say otherwise. Next time, I feel a migraine coming on, should I reach for that playlist rather than the aspirin? Apparently! 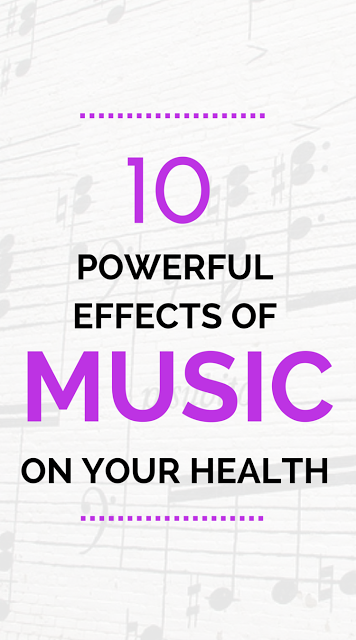 Studies say music can help sufferers reduce the intensity, frequency, and duration of headaches. Don’t miss this: Is that headache a migraine? See the checklist here and new ways to treat them without drugs. 3. MUSIC MAKE FOR A GREAT ENTRANCE. Incorporating music therapy during childbirth decreases post-natal anxiety and pain, increases the satisfaction with childbirth and reduces the likelihood of postpartum depression. I’d say that’s a great way to bring a child into the world! Don’t miss this: Lots of tips to get that body ready for pregnancy way before that little one arrives. 4. SLEEP EASY WITH THE RIGHT NOTES. I have lots of ideas on how to create a bedtime routine for better sleep here, but relaxing music is another great tool to beat insomnia. Many people find just 45 minutes of relaxing music before bedtime can make for a better night’s sleep. Researchers discovered that music can decrease the amount of cortisol, a hormone produced by the body in response to stress, which aids in sleep. 5. THOSE WITH HIGH BLOOD PRESSURE SHOULD CHOOSE THEIR MUSIC WISELY. Depending on the type of music, researchers in Italy and the United Kingdom found playing recordings of relaxing music could reduce blood pressure, but hold on! Music with a faster tempo increased it. 6. MUSIC CAN BE A GREAT STUDY PARTNER. Studying with music may help you retain the information. Here’s how: the information being studied activates the left brain while the music activates the right brain. Further, activities which engage both sides of the brain at the same time, such as playing an instrument or singing, cause the brain to be more capable of processing information as a whole. Don’t miss this: Staying calm during study time is crucial. Here are foods to get you there. 7. LISTENING TO MUSIC CAN REDUCE PHYSICAL OR EMOTIONAL PAIN. Studies performed in Denmark show that music may help us focus our attention on the music rather than the pain or it may actually help our brain release chemicals that reduce pain. Either way, it’s great to have a vehicle to lessen pain without painkiller drugs. 8. MUSIC TAKES YOU DOWN MEMORY LANE. Ever notice how listening to an old song takes you to that time in your life front and center? I think you can agree that is pretty powerful memory recall. 9. MUSIC CAN MAKE FOR A FITTER BODY. Anyone that has taken a spin class or goes to a gym or dance class knows first hand how music can clearly motivate you to exercise harder. Don’t miss this: Lots of workouts to choose from to get fit fast! 10. HEARD THE SONG DEEMED THE MOST RELAXING EVER? I hadn’t either . . . until I came upon this! This has been “scientifically proven” to be the most relaxing song ever produced. The song has the ability to slow heart rate, reduce blood pressure, and decreases cortisol stress levels at unprecedented rates. It has spa day written all over it, but let me know in the comments what you think! Don’t miss this: A fantastic new way for unlimited music streaming, curated playlists, be introduced to great new music as well as create personalized playlists. Were you listening to music when you were reading this? Hope so! And, if not, why not?! Very intresting blog.. Love reading this blog.. Listening to those top workout tracks can boost my physical performance and increase endurance during a tough exercise session.It benefit my physical and mental health in numerous other ways too. Thrilled you like the blog and learning new information. Music does make those workouts more bearable! Absolutely, Kathleen. And good point that music affects the nature of the world and something we can all share despite our language or culture. Thanks for coming by! Great to hear, Danielle. Music is a great mood changer, indeed! I've been a music lover alll my life and have studied to it and done all sorts of things. It is so important to me that I hear songs in my head even when music is not on. Good for you, Mary! If music is such a big part of your life, then you have been doing a lot of good for your health! I can understand your point about the studying part as it was a surprise to me as well when I read that, but apparently it can be helpful to some to retain information and learn new tasks. More research is being conducted as well on the topic. I appreciate you adding in here, Cayanne! Wow, these are really great benefits that I didn't even know about! I grew up playing music – my main instrument is the clarinet – and I love to listen to music when I run. But who knew that it helps my immunity and relieves headaches?! Pretty cool, huh? The more I researched it, the more I knew I had to share it. Incredible studies on this topic and I am so glad so many are learning something new here! Happy you came by! Music always helps put me in a better mood when I'm feeling down, or sometimes when I'm down I like listening to sad songs. It helps me feed into the emotions and then let them go. – and it's always motivating for a workout! I like that about listening to sad songs to intensify the emotion and then releasing them. Great point, Nicole! Thanks so much for adding that. It's the second time I'm reminded of the benefits of music only this week. Thank you so much for sharing this post on #tiptuesday. I love the fact this healthy habit is so easy, right? 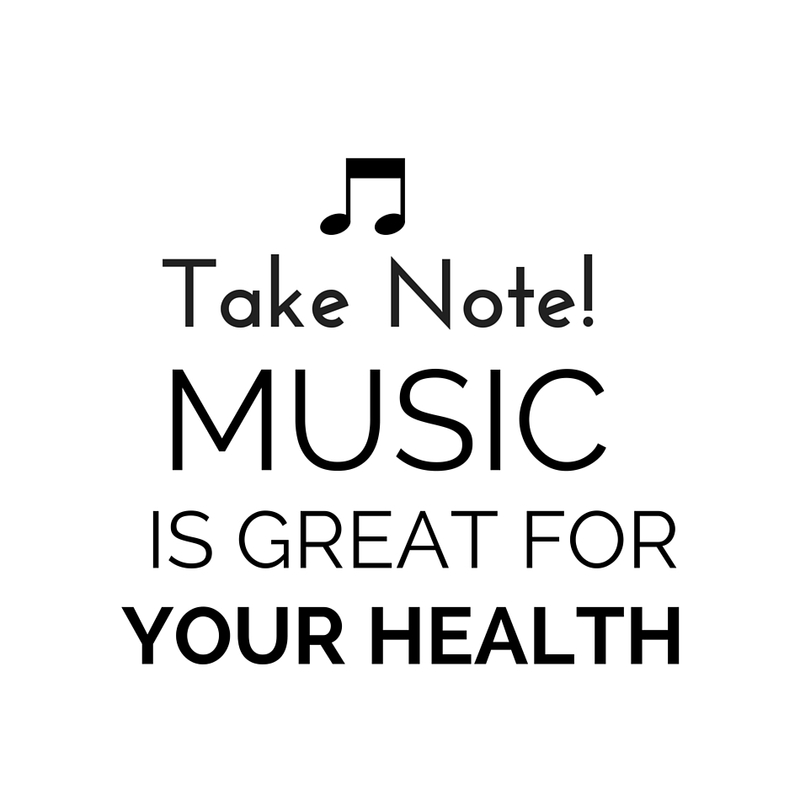 Turn on some tunes to benefit your health or even better – learn to play an instrument, join a group, etc. So many options. Thanks for coming by, Debbie! I was a music teacher for a few years before I had my 3rd baby and quit. So I obviously love this list! You had some things on here I didn't know about. I'll definitely be checking out the migraine info. As for not being able to read music, maybe that's your jazz side coming out! If you have a basic understanding of chords and scales, you don't have to be able to read music to enjoy playing it. Thanks for the encouragement, Jamie! Spoken like a true music teacher! I am so happy to hear you learned new things here. And, do check out the other post on migraines I listed above and will put the link here again below. That lecture was fascinating and hope it can help others. Great article. I love to sing in the car and if I feel down I definitely play some of my favorite tunes. However, I never thought about the relaxing part of music, Thanks for sharing on our Tips & Tricks party. Hope to see you next week! SInging in the car is great. I see everyone doing that! Pleased to hear you learned something new and hope you'll be back for even more, Patti! I love seeing you here, but I understand completely. I do hope you get the answers you seek and I really look forward to continuing to connect on Twitter. I wish you the very best, Launna! Kids really respond to music. My youngest as an infant used to cry in the car until I switched the radio station to something she liked. I kid you not. Love cooking to music, too! I never used to do this, but now I always listen to the radio while I'm working … and it really helps me to 'enjoy' my day rather than just 'endure' it … haha! (I probably need to change jobs … haha!) So what is the most relaxing song you mentioned? Would love to hear that! I was at a spa a few weeks ago and coudn't believe how relaxing the music was … typical spa music but I found myself thinking 'I need to buy this music!' while I was lying there! Hi Helen — Good point about music helping to make your day just better all around! That song deemed the "most relaxing" is there at the green link by the way. You just have to page down a bit and you will see it. Give it a listen and it will bring you back to your spa day, for sure! Music totally soothes the soul, Lori! Love this post 🙂 I find music definitely helps my concentration when I'm hitting the books! So interesting regarding the studying and music, right? It seems like it would be a distraction but it really works for a lot of people and studies are showing it! Thanks for adding your experience with it! I just couldn't live without music, especially when it comes to my workouts. I hate it when I forget my headphones at the gym. That's great music is such a big part of your day, Dannii! Oh yes, the music really keeps you motivated at the gym – no doubt!